Another spankin weekend of NAB Cup action and some more young guns on the old radar. We discussed the young colts who have put their hands up for this version of the Rookie Cheat Sheet in last nights podcast. Notable by their omissions are poor old Dayne Zorko (BRL) and Dylan Shiel (GWS). The Zork man has been confirmed by Vossy as having a buggered hip and will be out till early in the regular season. Dylan Shiel didn’t do much to inspire confidence by appearing in a moon boot last weekend and is off the list. Suggestions that the boot was to keep that particular foot warm have been put to bed. We wish the lads a speedy recovery. Stay tuned – The Crouching One will be revealing the first version of his team in the next day or so. He reckons it’ll give my mob a run for their money. Dreamin. Tell him he’s dreamin. no no, thank you mate. no problem, so glad i came across this page, youre a legend! Hey Jock I was wondering if you could give me some feedback on my team mate! I was afraid if i posted in the comments with your team it'd go missing and be un-answered. Here goes! Defence: Goddard, Lids, Shaw, Fisher, Buggs, Darley, Morris, Brown and Wilkes. Forwards: Franklin, Fyfe, Chapman, Dusty, Cooyou, Treloar, Hall, Smedts andKerridge. Hope you find time to give me some fead back Jock! Do u know why kyal horsely didn't play for the suns on wknd mate?? And also what does the red,green orange etc mean on cheat sheet? Keep up the good work!!! Tim McIntyre caught the eye, has the build and attitude that a coach like Sanderson will love. Mid/Fwd and rock bottom price. Yes please. Did look ok didn't he – absolutely burning up the track as well. The doubt there is that he was struggling for a game for Sturt in the SANFL midway through last year.. ready for the step up? 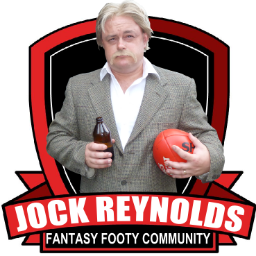 We need a JR supercoach league too, looking forward to stoushing it out with the three greats! Cheers mate 😉 Jock Reynolds for PM!! Timmy McIntyre didn't look out of place on Sunday at all! I think it will be between him and Callinan as to who gets the last spot on the senior list. Callinan is a crafty little fella, can kick a footy with the best of them that lad… Bit expensive for DT but. Can you provide news links about these injuries to Zorko and Shiel? I haven't seen anything to totally confirm this. Whats your view on Devon Smith? Jock, what's your take on Couch from the Dees? Are there any rookie mid/def this year that will play?? How about Richie Cunningham @ the swans? Yeah I like the look of Cunningham too Oliver. Clay Smith, Dell'Olio, Couch and Saad should get a mention in vers #4 if they prove well again. Kevin of Los Angeles asked, ‘Can people be pushed into cheating’. may give you the leverage you need.